"Lex” is from Palo Alto, CA. She played basketball for Menlo-Atherton High School where she earned All-League Honorable Mention and 2nd team All-League for track. She won the perfect attendance award and was on the Honor Roll. Her most memorable basketball moment was when she got “close-lined” and broke her nose. Her dream job is to be a food taster. Her hobbies include shopping and dancing. 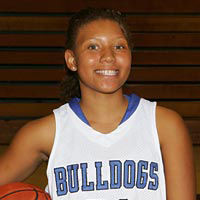 She wants to be a versatile player this year for the bulldogs. She is known for her quickness, passing, and ability to penetrate the defense. Her mother is Stella Jackson.